The SDSA was founded in 2005 to provide safety standards and independent professional assessment and certification for specialist driving professionals whose activities were not covered by existing qualifying bodies. This can include driving professionals who supervise or accompany guests on driving experiences on technical driving facilities, manufacturer driving days, advanced handling facilities, specialist terrains such as desert or ice, closed facilities authorised for training young pre-licence drivers, demonstration and display drivers, photography and film precision drivers etc. who previously had no access to independent certification of skills and professional standards. Professional driving skills practitioners require very special life abilities and affinities, extensive experience and practice, and complex training. Independent validation of these skills is essential to achieve consistency of standards and professional standing within the industry. The objective of the organisation is to provide codes of practice to ensure safe and professional operation, and to assess and certify professional competence for experienced professional practitioners of specialist driving skills. The assessment process includes checks with CRB and licencing authorities. Most general driving skills are already covered by existing certifying and authorising bodies for driving activities. In the UK these include the DSA, MSA, BORDA, ARDS, IOPD and APCO/ACPOS. For example, the DSA licences instructors for teaching basic driving skills on the road. The MSA licences coaches and authorises venues for competitive motorsports activities. BORDA certifies instructors for off road 4x4 driving skills. 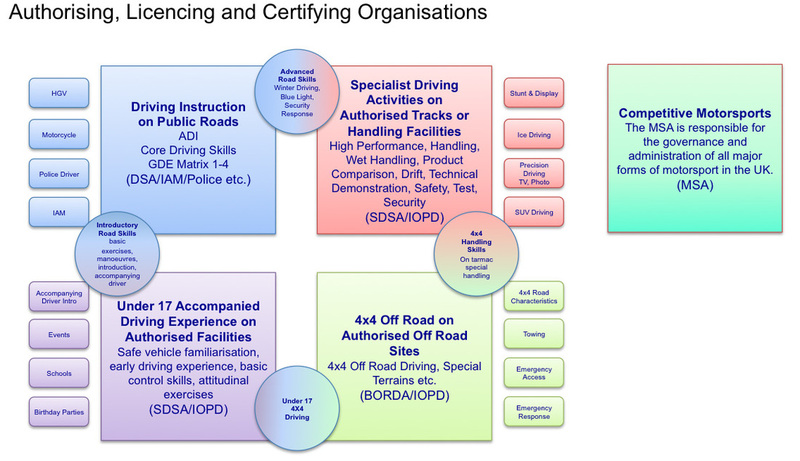 IOPD authorises venues for specialist and non-competitive driving activities. APCO/ACPOS sets the standards and assessment regime for Police Drivers. Any activity that falls within a defined existing area should be referred to the appropriate authorising body. In some countries there are specific national regulatory bodies who have jurisdiction and should be referred to to ensure compliance with specific legal requirements. The SDSA provides independent assessment of specialist professional driving skills without reference to local or national regulation, considering only the specific skills and their application in relation to current international best practice and expertise. SDSA will consider applications to develop independent assessment and certification for other existing or new areas of specialist professional driving activities that are not otherwise covered. Persons having current SDSA certification are entitled to use the suffix SDSA (Specialist Driving Skills Associate) after their name to indicate that they are an SDSA certified Specialist Driving Skills Professional.